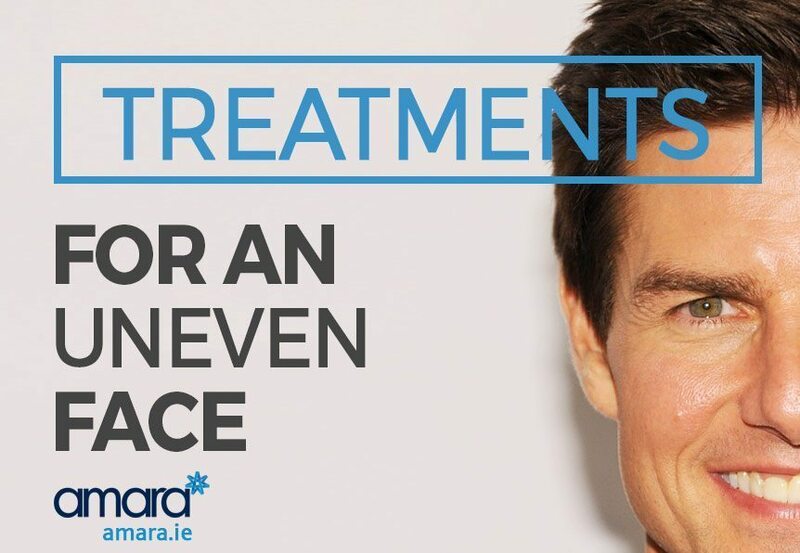 One of the most common complaints I see in Amara clinic is an uneven face. In various studies babies, children and adults were shown different faces with varying degrees of asymmetry. Research showed that the more symmetrical a face, the more attractive. How can you tell if a baby likes a face I wondered? Well babies will more often than not focus on what they like and 9 times out of ten they will look at the more even and symmetrical face. Almost everyone has an uneven or somewhat asymmetrical face – in fact if you look at the most beautiful faces in Hollywood they are mostly symmetrical (although nobody’s is perfect). However symmetry isn’t absolutely necessary for beauty – One notable exception is Tom cruise as you can see from the photo below. The most handsome man in Hollywood (by several surveys) is Denzel Washington, he also happens to have one of the most symmetrical and even faces in Hollywood. People who drive for a living, such as truck drivers often have more aging on the side that is exposed to the sun’s harmful UV rays. 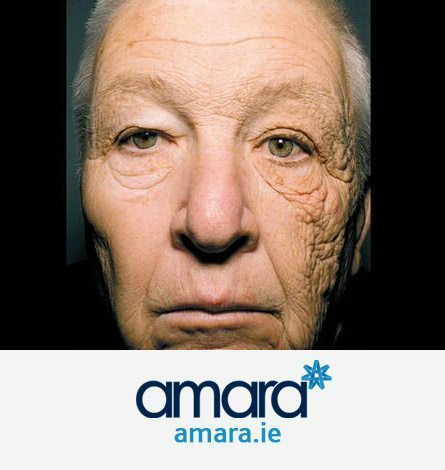 What side of the car you are driving on determines what side of your face will be the worst affected, therefore in Ireland the right side of your face will be the one that suffers the most. You can see the effect of sun damage in the image of the trucker to the right. Tip: Many moisturisers come with a high SPF rating, wearing one will reduce the effects of aging for the Sun. We all sleep either on our backs or on our side or front, (duh!). The safest way to sleep from an aging perspective is on your back as fluid drains to the back of the head overnight rather than to your eyes and face. When sleeping on your front or your side you also tend to turn your head either left or right. This means that you will have swelling on the side that is down on your pillow. This side also has to cope with excessive weight (from the rest of your head) resulting in more strain and hence aging. Any injury or Bells Palsy episode can change the way the muscles on one side of the face act, which can result in facial unevenness or asymmetry. 4. Uneven or Asymmetrical Muscles. We tend to use muscles on one side of our face and body more than the other. Repeatedly doing this will result in stronger muscles on one side (it’s working out more) This can change the size of that side of the face and also how that side of the face moves. Is your face uneven or asymmetrical? The Selfie Test! Have you ever taken a selfie and the photo that came out wasn’t the same as what you saw? One day I was taking a selfie (I know, I know guys shouldn’t take selfies, but it happened). I noticed when I was taking it that the picture looked great, then I pressed the take photo button, the screen went black and then the picture came up…It looked different. It didn’t look right compared with what I had seen just before I pressed the photo button. This kept on happening and it took me a while to figure out why. On many phones, including the iPhone I was using at the time, the image you see before you take a photo is a mirror image of yourself. When we look in the mirror, what you see is your face, but backwards to how everyone else sees it. I’ll try and explain better – you see your left as your right and your right as your left? am I making sense? Because you are used to seeing a mirror image of yourself the phone companies decided that for the front facing camera it is a good idea to have a mirror image effect on the camera. And then when you take the photo they spin it around to show you what everyone else sees. So a quick way to find if your face is symmetrical or uneven is to do the selfie test. If your pre photo image is very different to your post selfie image, that means you are asymmetrical. Voila! In my practice there are a few asymmetrical or uneven face presentations that commonly appear. Often people will come for correction of a gummy smile. This is where the smile reveals more gum than the person is happy with. Sometimes this is uneven and there is more gum visible on one side versus the other. Using a little botox on either or both sides to correct the muscle that reveals this extra muscle is the way to fix this. Often on one side of the face there is more fat loss than on the other side. This is often something that we get used to and don’t see until pointed out or until we take a photo and we see the difference between what we see in the mirror and what everyone else sees. To correct this it is often a case of using an uneven amount of cheek fillers Dublin. For example if there is volume loss on the cheeks on one side more than the other, it may be necessary to put 70% of a filler treatment on one cheek and only 30% on the remaining side to even things out. Sometimes volume loss (loss of fat) results in uneven lines. The face has more lines on one side than the other as a result of the tissues being a little thinner on that side. The treatment for such asymmetry is to add filler to correct the difference between the two sides. Are you interested in any of the treatments outlined above? Check out our full range of skincare treatments on offer and book a consultation with us today. My face is uneven. One side of my face is bigger than other. One side of face growth has been proper but other side it’s not. Please help me i don’t like this plzz someone help. Please book in for a consultation so our doctor can review your issues. Can it be treated without any surgery?? I am not sure what you are referring to. All of our treatments that are available are non-surgical. Please book in for a consultation by filling out the contact form. The doctor can assess you and recommend treatment. I am also having this problem of facial asymmetry ,my left cheek us puffy than the right one along with the upper eyelid lid. I am really depressed due to this uneven and sudden change in my face. please help me out with a proper treatment advice. Hi, Sabreen, If you are interested in a consultation for Filler please book in with us as that is the only way the doctor can assess you. Hi Banu, We currently only offer a clinic in Ireland. it sounds like you may be looking at a Bruxism treatment but this could not be decided without a consultation beforehand. I’m sorry to hear that! I might suggest that you book in for a consultation with a specialist in your area. Without seeing you it would be very hard to assess your face and let you know what would be suitable. Hi, i am from Pakistan. i have same above problem. When i take selfie but picture has not good.pleae give me easy solution. I m in trouble.kindly help me. Hi Bakht. A consultation would be needed for us to properly assess you. .. I live in India plzz help me out!. My actual face where my eyebrow is in even. One side of my face is higher than the other when taking pictures. I’m only 14 what do I do??? I’m afraid we cannot offer treatments to anyone under 18. Perhaps if it is really bothering you it is something to chat with your parents about and see what the suggest. I’m sorry I couldn’t help you any further. Hi! So one of my cheeks is also fatter then the other side and I was wondering if there is any procedure you can do to get rid of the fatter cheek? I saw there is fillers to even the cheeks out but I do not want both of my cheeks to be chubby. I was also wondering if a dermatologist is the best to go to consult this with? I have discussed it with my doctor but she just said that everyone has asymmetry but I feel as though my cheeks are very uneven so I’m thinking I should talk to a dermatologist if they know what to do? We would offer dermal filler treatments to increase the volume. As we do not have a dermatologist on staff I’m afraid we cannot advise you on what they would say. I would suggest seeing if your doctor could refer you to a dermatologist. A consultation would be needed to asses your lip to see if it would be suitable for filler. is it possible to cure unbalance/assymetric face without surgery? I had a jaw op 26 years ago. My upper jaw moved back. Since then my left side “hang down” asif I have bells pulsy. I get depression medication for that also medicine for epilepsy. HELP!!!!! I would recommend attending your physician who performed your operation and aftercare, to see what the recommend. General question, Can any of the treatment available in India ? Unfortunately, we are based in Dublin, Ireland. So no. Apologies for the delayed response. Please give the clinic a call on 01 676 1074 and we’d be happy to have a chat and help you out.